If you are new to both R and Machine Learning Server, this tutorial introduces you to 25 (or so) commonly used R functions. 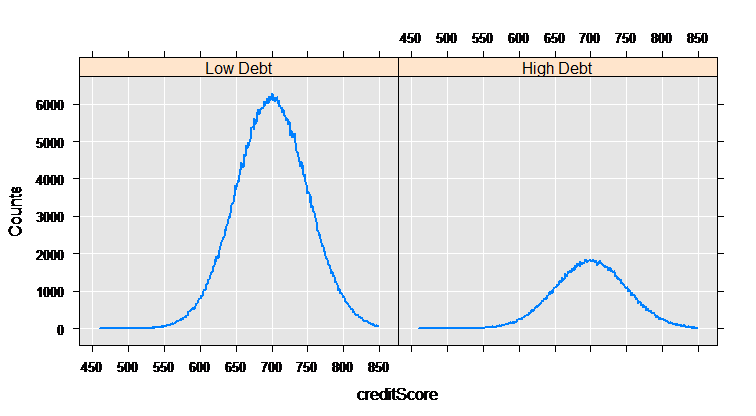 In this tutorial, you learn how to load small data sets into R and perform simple computations. A key point to take away from this tutorial is that you can combine basic R commands and RevoScaleR functions in the same R script. This tutorial starts with R commands before transitioning to RevoScaleR functions. If you already know R, skip ahead to Explore RevoScaleR Functions. R Client and Machine Learning Server are interchangeable in terms of RevoScaleR as long as data fits into memory and processing is single-threaded. If data size exceeds memory, we recommend pushing the compute context to Machine Learning Server. This is our simplest tutorial in terms of data and tools, but it's also expansive in its coverage of basic R and RevoScaleR functions. To complete the tasks, use the command-line tool RGui.exe on Windows or start the Revo64 program on Linux. On Windows, go to \Program Files\Microsoft\R Client\R_SERVER\bin\x64 and double-click Rgui.exe. On Linux, at the command prompt, type Revo64. The tutorial uses pre-installed sample data so once you have the software, there is nothing more to download or install. The R command prompt is >. You can hand-type commands line by line, or copy-paste a multi-line command sequence. R is case-sensitive. If you hand-type commands in this example, be sure to use the correct case. Windows users: the file paths in R take a forward slash delimiter (/), required even when the path is on the Windows file system. Because RevoScaleR is built on R, this tutorial begins with an exploration of common R commands. R is an environment for analyzing data, so the natural starting point is to load some data. For small data sets, such as the following 20 measurements of the speed of light taken from the famous Michelson-Morley experiment, the simplest approach uses R’s c function to combine the data into a vector. Often for testing purposes you want to use randomly generated data. R has a number of built-in distributions from which you can generate random numbers; two of the most commonly used are the normal and the uniform distributions. 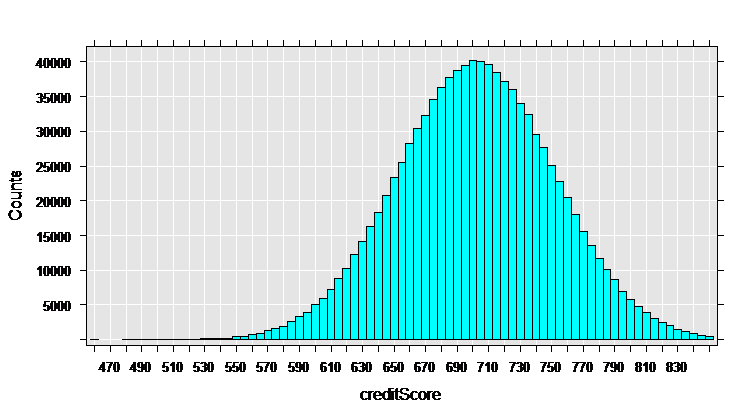 To obtain a set of numbers from a normal distribution, you use the rnorm function. 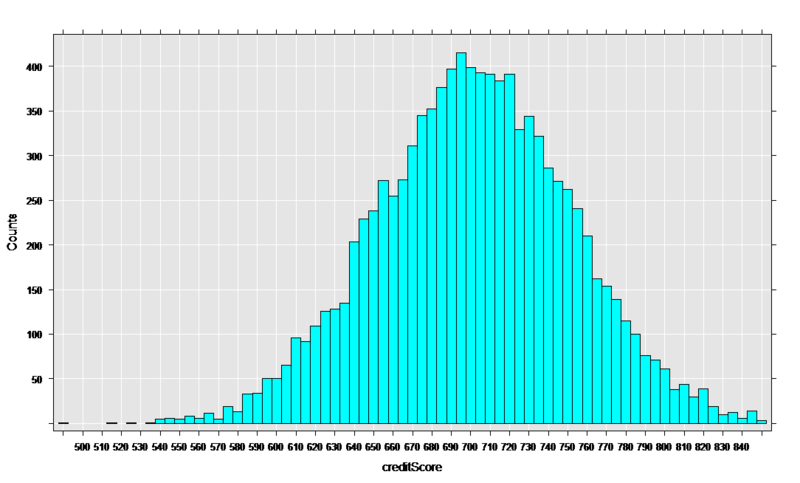 This example generates 25 random numbers in a normal distribution. If you are working with big data, you’ll still use vectors to manipulate parameters and information about your data, but you'll probably store the data in the RevoScaleR high-performance .xdf file format. 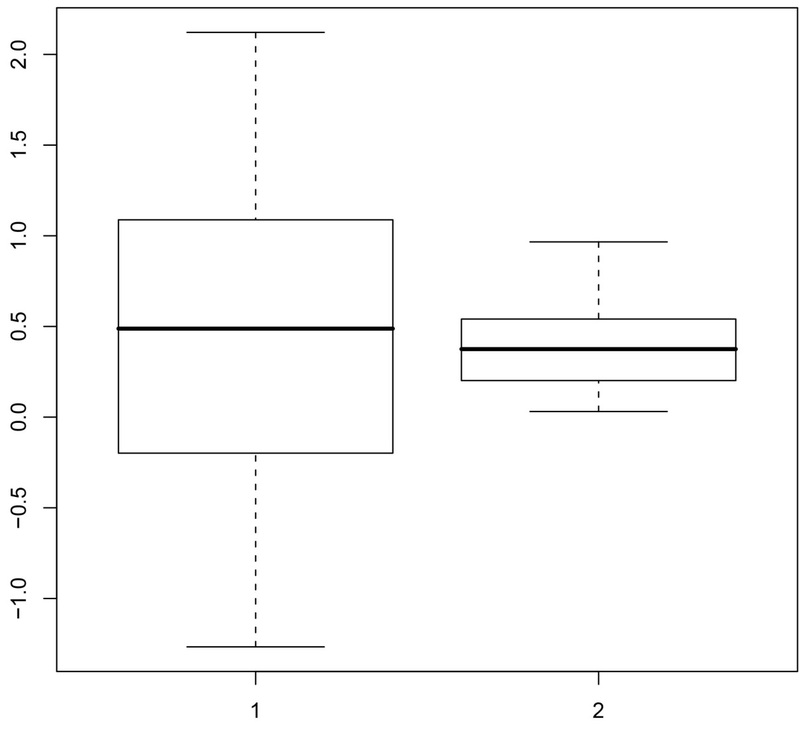 The resulting histogram is shown as the right plot in the figure following. 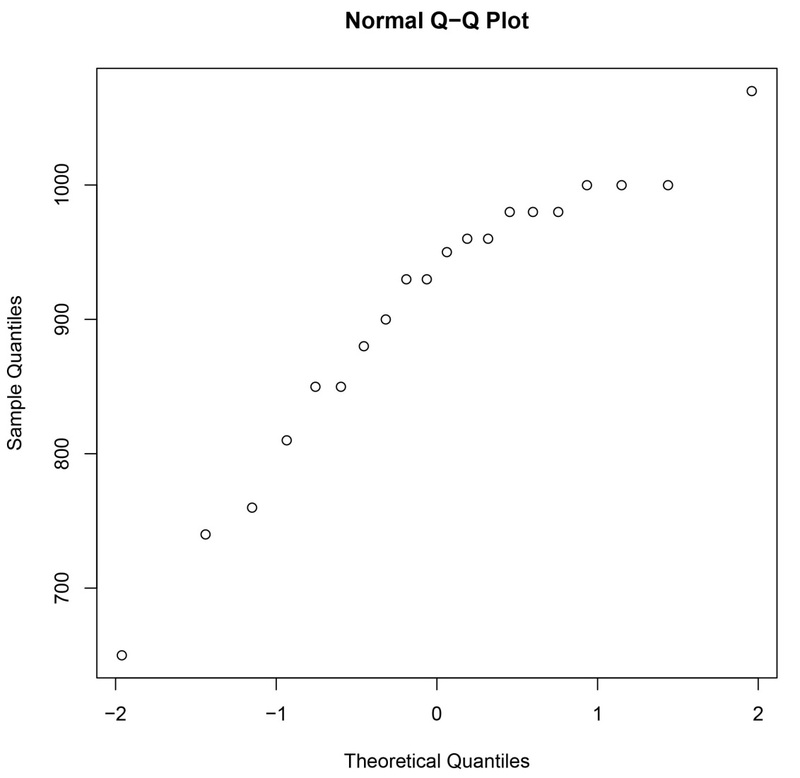 The decided bend in the resulting plot confirms the suspicion that the data are not normal. These plots are great if you have a small data set in memory. 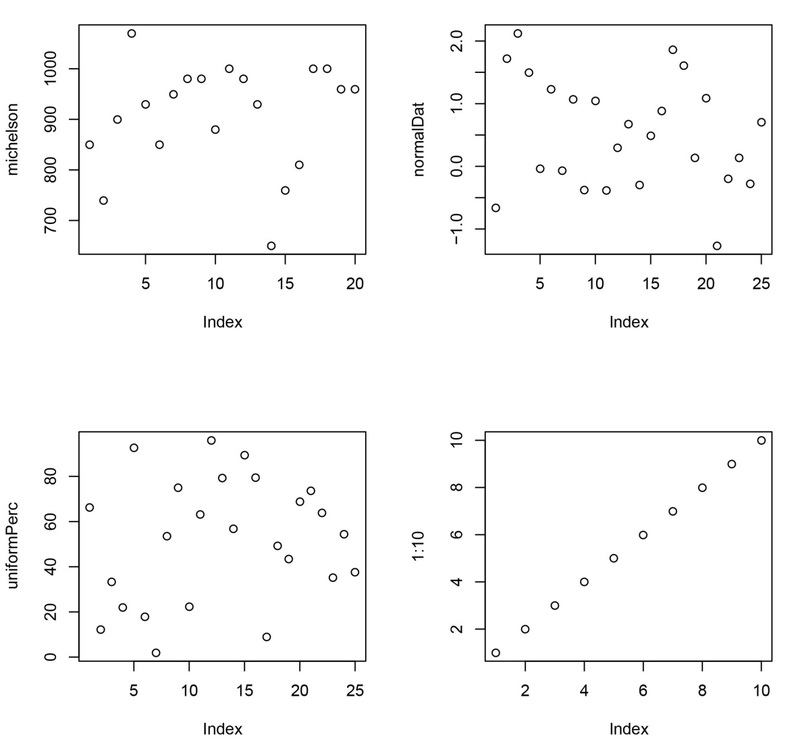 However, when working with big data, some plot types may not be informative when working directly with the data (for example, scatter plots can produce a large blob of ink) and others may be computational intensive (if sorting is required). A better alternative is the rxHistogram function in RevoScaleR that efficiently computes and renders histograms for large data sets. Additionally, RevoScaleR functions such as rxCube can provide summary information that is easily amenable to the impressive plotting capabilities provided by R packages. Min. 1st Qu. Median    Mean 3rd Qu. Max. The rxSummary function in RevoScaleR will efficiently compute summary statistics for a data frame in memory or a large data file stored on disk. On Windows, the working directory is probably a bin folder in program files, and by default you don't have permission to save the file at that location. Use setwd("/Users/TEMP") to change the working directory to /Users/TEMP and save the file. Notice how read.table changed the names of our original “2B" and “3B" columns to be valid R names; R names cannot begin with a numeral. 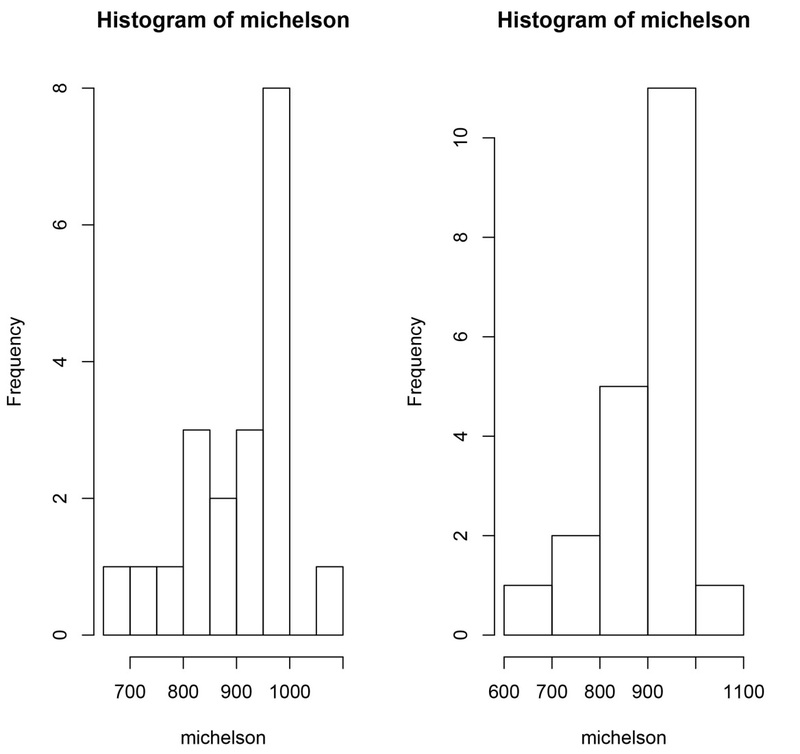 Most small R data sets in daily use are data frames. The built-in package, datasets, is a rich source of data frames for further experimentation. The output is an alphabetized list of data sets that are readily available for use in R functions. In the next section, we will use the built-in data set attitude, available through the datasets package. The attitude data set is a data frame with 30 observations on 7 variables, measuring the percent proportion of favorable responses to seven survey questions in each of 30 departments. The survey was conducted in a large financial organization; there were approximately 35 respondents in each department. 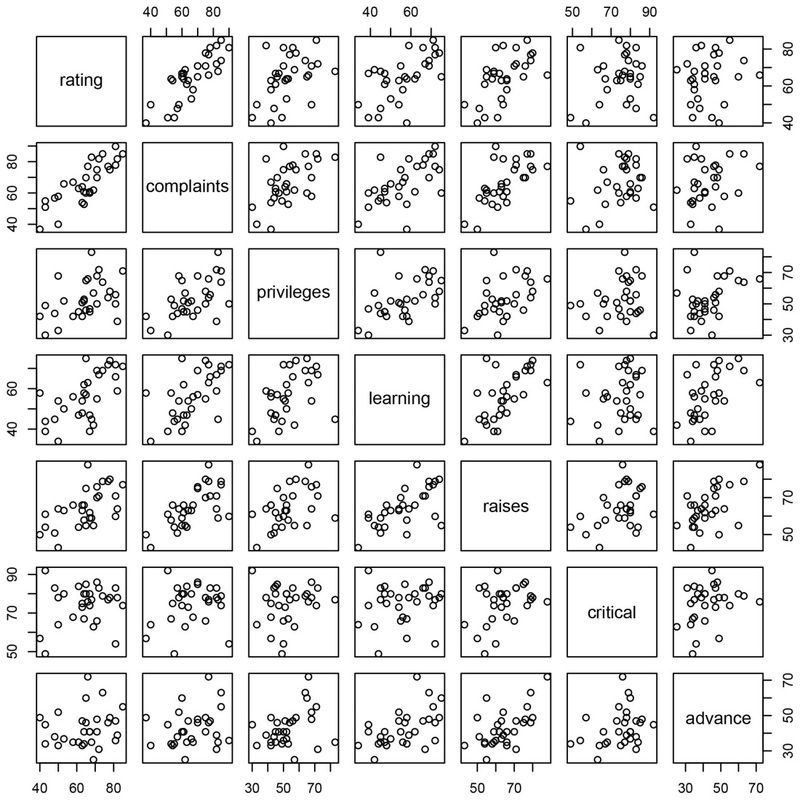 The resulting plot is a pairwise scatter plot of the numeric variables in the data set. The rxLinMod function is a full-featured alternative to lm that can efficiently handle large data sets. Also look at rxLogit and rxGlm as alternatives to glm, rxKmeans as an alternative to kmeans, and rxDTree as an alternative to rpart. A list in R is a flexible data object that can be used to combine data of different types and different lengths for almost any purpose. Arbitrary lists can be created with either the list function or the c function; many other functions, especially the statistical modeling functions, return their output as list objects. You will regularly use lists and functions that manipulate them when handling input and output for your big data analyses. 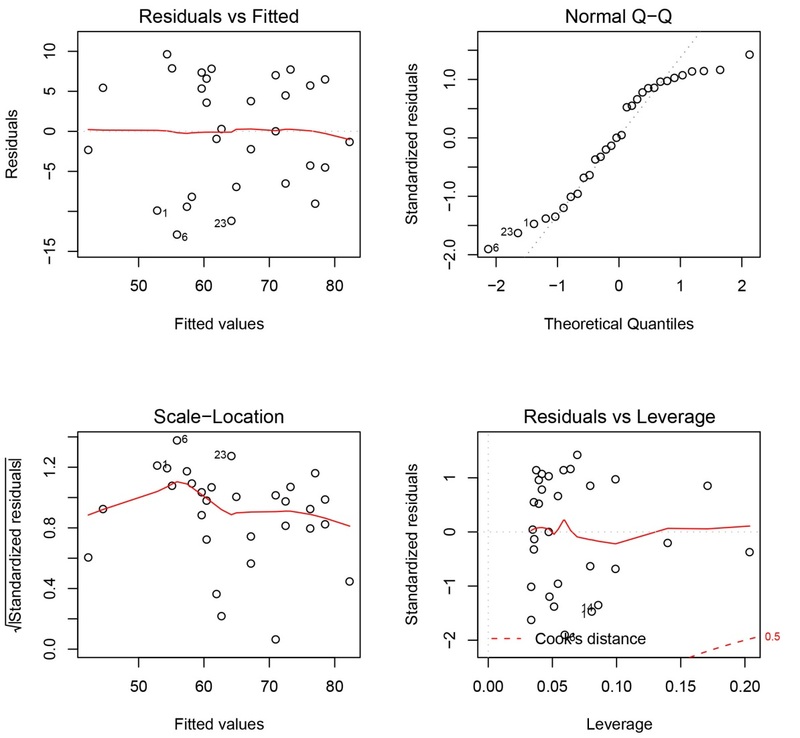 The RevoScaleR package, included in Machine Learning Server and R Client, provides a framework for quickly writing start-to-finish, scalable R code for data analysis. When you start the R console application on a computer that has Machine Learning Server or R Client, the RevoScaleR function library is loaded automatically. The rxImport function allows you to import data from fixed or delimited text files, SAS files, SPSS files, or a SQL Server, Teradata, or ODBC connection. There’s no need to have SAS or SPSS installed on your system to import those file types, but you need a locally installed ODBC driver for your database to access data on a local or remote computer. If we anticipate repeating the same analysis on a larger data set later, we could prepare for that by putting placeholders in our code for output files. An output file is an XDF file, native to R Client and Machine Learning Server, persisted on disk and structured to hold modular data. If we included an output file with rxImport, the output object returned from rxImport would be a small object representing the .xdf file on disk (an RxXdfData object), rather than an in-memory data frame containing all of the data. There are a number of basic methods we can use to learn about the data set and its variables that work on the return object of rxImport, regardless of whether it is a data frame or RxXdfData object. 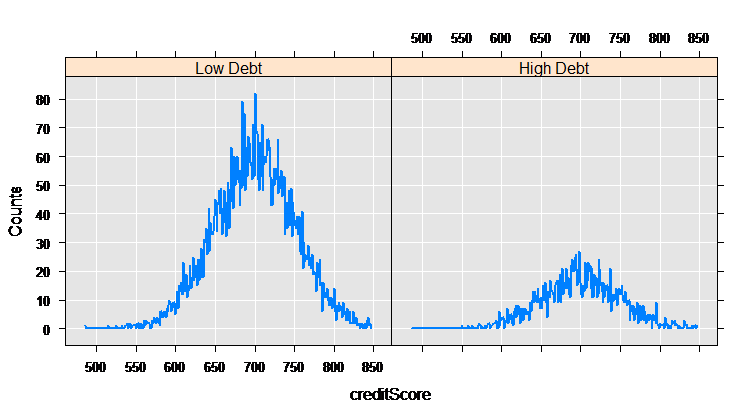 "creditScore" "houseAge" "yearsEmploy" "ccDebt" "year"
Our new data set, mortDataNew, will not have the variable year, but adds two new variables: a categorical variable named catDebt that uses R’s cut function to break the ccDebt variable into two categories, and a logical variable, lowScore, that is TRUE for individuals with low credit scores. These transforms expressions follow the rule that they must be able to operate on a chunk of data at a time; that is, the computation for a single row of data cannot depend on values in other rows of data. Until now, our exploration has been limited to small data sets in memory. Let’s scale up to a data set with a million rows rather than just 10000. These larger text data files are available online. Windows users should download the zip version, mortDefault.zip, and Linux users mortDefault.tar.gz. That’s it! Now you can reuse all of the importing, data step, plotting, and analysis code preceding on the larger data set. Because we have specified an output file when importing the data, the returned mortData object is a small object in memory representing the .xdf data file, rather than a full data frame containing all of the data in memory. It can be used in RevoScaleR analysis functions in the same way as data frames.